Studying enough to reach your goals and ambitions can be a challenge, especially if you don’t structure your time right. You may find yourself procrastinating, or spending too much time on unimportant matters – this will not only leave you with less time for studying, but also take its toll on your sleep time and eating habits. To make sure you have enough time for quality sleep, meals, studying, but also socializing and relaxing, all while staying productive, here are some best organization tips for students. Waking up earlier to make a to-do list every day will only take away from your sleep, so it’s best that you compile your to-do lists in the evenings, before bed. Tomorrow, as you finish each of these items in your list, cross them out, or put a checkmark next to them. This way, you’ll maintain a sense of progress as you watch the number of unchecked tasks decrease during the course of the day. If you checkmark all the tasks before the day is done, you’ll feel a surge of success and be encouraged to keep up the good work with your future to-do lists. After creating a straightforward to-do list, it’s also important that you note in the hours when you’ll be tackling these tasks, so that you keep your day in perspective. What makes an hour-by-hour schedule stand out from a regular to-do list, is that you’ll include your everyday activities (breakfast, brushing your teeth, showering) as well, and not just your tasks. Goals are what give you the motivation to move forward, so it’s vital that you address them. For example, revising for the Economics test will help you pass it, which will up your grades, and make sure you have more time to relax and unwind, instead of studying to retake the test. You can also set separate, personal goals you’ll want to work on every day. For example, this can be working out every day for at least 30 minutes, reading 20 pages of a book, finding time for your creative hobby, and similar. In any case, remember that there are specific actions you can perform to reach your highest goals – for this purpose, you can make use of the Pareto principle. According to it, 20% of the right efforts can bring 80% of results. So, make sure that most of your efforts and actions are aimed at reaching the right goal – this can be writing a seminar paper that brings 80% of your grade. Nothing ruins concentration and focus like distractions do, and digital devices and Social Media in general, are one of the biggest culprits you should avoid. according to one research from the Massachusetts Institute of Technology, students who weren’t allowed to use their digital devices in exams actually performed better. according to another research conducted by the London School of Economics, banning mobile phones from schools entirely improves the student’s test results – in the research, this was especially true for low-achieving students. One survey showed that student’s focus largely depends on their phone activity – if constantly distracted by vibrations, flashes and beeps coming from their phones, they can keep focus only for 3 minutes. Because of this, it’s best that you save your digital devices and mobile phones for after classes, and then only use them for productivity apps, online research for work, and other activities that benefit your studies. Facebook, Instagram and Twitter are big time wasters, but not as big as you’d think – according to one poll, most college students spend about an hour on Social Media. Still, that’s about 7 hours a week you could be spending on other activities – if not on studying, then on reading books, meditating, engaging in creative hobbies and other more beneficial activities. The alarming number is that about 11% spend more than 6 hours on Facebook, about 8% spend this amount of time on Instagram, and 3.4% spend it on Twitter. The biggest online distraction is Netflix – about 92% of US college students use a Netflix account, which may lead to binge-watching, and bad sleep-quality, as a result. The answer to this problem would be to leave Netflix and Social Media for the weekends and holidays, if you find you can’t give them up altogether. They may even serve you as rewards after stressful, study-packed time periods – at the end of such a day, browse your Instagram feed or watch one episode of your favorite TV show – but make sure to keep it at one. Visual learners are keen on learning by seeing – graphs, charts, infographics, tables are all likely to help them remember the subject’s material. If you need to see data to remember it, and have the habit of visualizing new information when learning about it, chances are you’re a visual learner – you should always aim to learn new material through a visual form. Kinaesthetic learners learn best through experience – experiments, practical tests, exploring solutions, science projects and all hands-on experience is the best way for this type of learner to retain knowledge. If you find it difficult to sit still and find that you have to take part in the process you’re learning about or make tests, you’re likely a kinesthetic learner. Auditory learners retain information best when they hear it spoken aloud – that’s why attending lessons, discussions, taping themselves reading lectures and listening to these recordings, are the best practices for them. If you read aloud when studying and actually remember information this way, you’re probably an auditory learner. Learners who retain data best from written words are reading/writing learners – textbooks and handouts given in class are their most effective way of learning. If you take a lot of notes, create to-do lists, list tasks you’re probably this type of learner. Each of these types has preferences for a certain learning approach and should adjust learning habits accordingly. You most likely belong to at least one of the four types, but you also may be a mix – a learner who finds the most value in charts, but also learns a lot from notes taken in class. Or, a learner who reads out loud, but has to try out every theory in person. Once you realize your habits, and identify your type, make sure to follow the rules for successful retention of information for your type of learner. Knowing when you should track time means knowing when you should start studying. 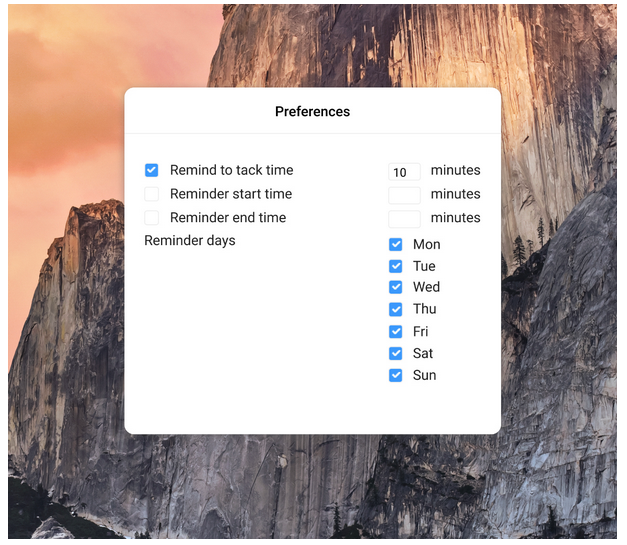 If you’re a Mac user, you’ll be able to set reminders in Clockify, and they will tell you to start tracking time – this can serve as a reminder for you to start studying. For example, you want to study every day from 9 a.m. to 12 p.m. during exam periods. Just, set the reminder start and end time, and you’ll receive notifications to start the timer at 9 a.m. and stop it at 12 p.m. – this way, you’ll feel compelled to study during this time. If you want to spend Saturdays and Sundays on leisure activities, just disable the reminders in the Preference settings. Just track the time it takes you to finish a portion of the materials on your usual study hours, say, mornings. Once you track your time for a couple of days during the mornings, analyze your results in the Dashboard and see how much time it takes you for study activities. If you find it takes you a long time to finish simple Math problems when you start working on them at 9 a.m., you’re probably not a morning person – you should allocate these activities to later in the day. Make use of the integrations on the Clockify extension for Chrome, to combine Clockify with other productivity apps (Trello, Todoist, Google apps, Evernote etc. ). Whenever you switch from one activity to the next, just add the appropriate project, task and tag, and start tracking time. 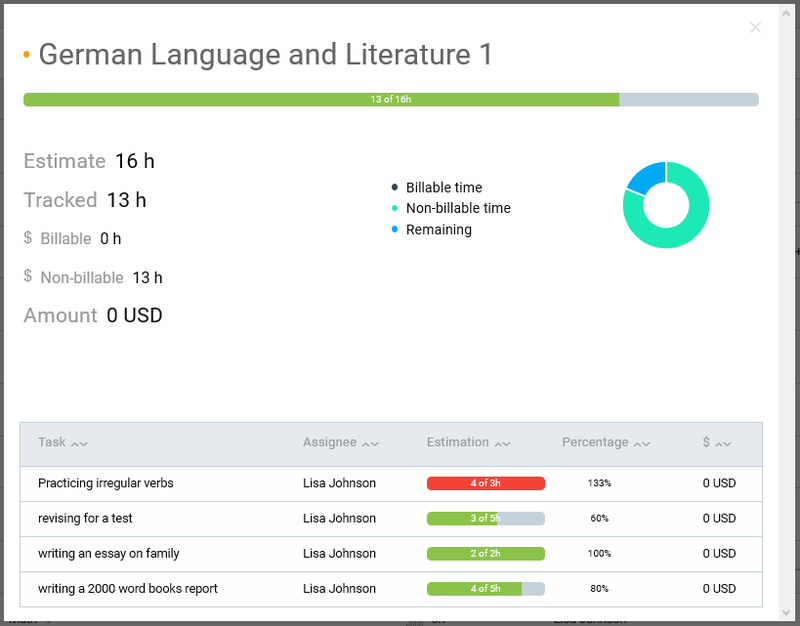 Later on, you can go to Reports, filter by specific project, task or tag, and see how well you fare for each parameter – for example, how much time you’ve spent studying for a specific exam within a week. Find out how much time it takes you to master a subject in general, for future reference – this way, you’ll know whether you had enough time to master materials for a test. If you’ve exceeded your estimation, you’ll know that you need more time for studying this subject, so you’ll start earlier next time. To get a clear answer on this, just go to each Project (subject) and set estimates – you can set an estimation for the entire subject, or break it down to tasks (sections of the textbook, or types of exercises to practice). Then, you’ll be able to set individual estimates just for these tasks. 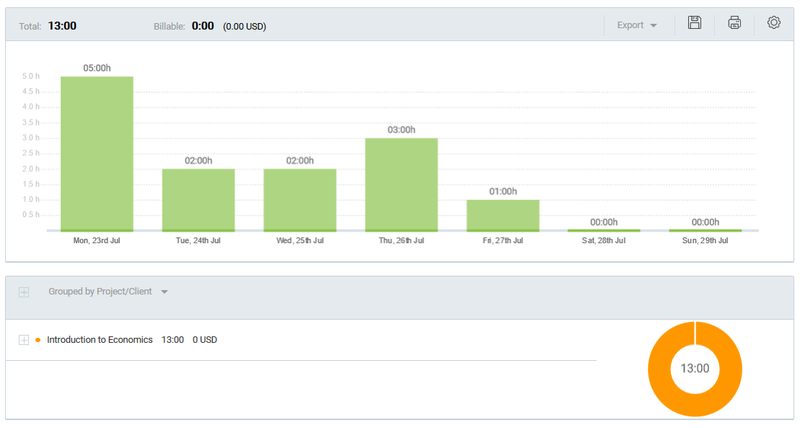 This way, you’ll be able to track your real-time results and compare it with your estimates. From time to time, you’re bound to be tasked with a group research, seminar paper or presentation, and you’ll want to make sure everyone does their share of the work. In Clockify, you can create the presentation as a new project, add fellow classmates as team members, and assign them to specific tasks. You can estimate the time it’ll take for everyone to finish their tasks, and make sure everyone is on track with the deadlines. Exam time can be stressful, especially if you have a large number of exams crammed into a short time period. You’ll have to find time to study, revise and actually attend the exams, which doesn’t really leave you much time for anything else. Still, you’ll have to find time for sleeping and meals, to help you perform your best, but also keep your health. Just like during regular class activities, scheduling will be your best friends during exams – though most of your time will now be dedicated to pure studying. The best practice is to note down the days and times when your exams are due in a planner: this way, you’ll gain the perspective on how much time you actually have to finish everything. For example, if you consider your exams three weeks ahead, you may find that you have 16 days before your first two exams, and 17 days before your third exam. 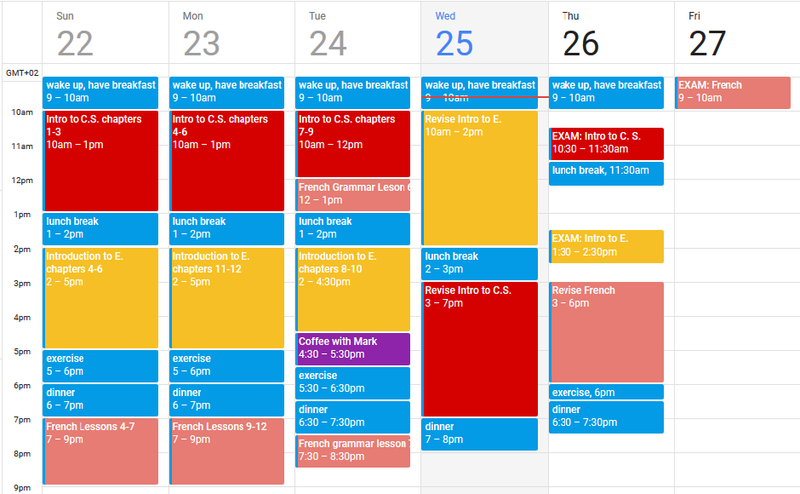 Once you have a timeframe, you’ll just need to parse your class material into manageable chunks allocated to each of the days you have left before the exams. Roughly speaking, if you have to work on 15 different Physics problems, you’ll aim to focus on each problem on one of the 15 days before the exam. Or, if a different subject is more challenging than Physics, you’ll allocate some of the Psychics’ study-time to this more challenging subject; it’s important to identify your weak areas, and allocate more time to them. Knowing how much time you have before an exam, and how much class material you have to go through, gives you a sense of control that you’ll finish everything on time – you’ll just have to make sure you stick to your schedule. Make sure to allocate study time to your productive peak hours – you may urge yourself to study first thing in the morning, but this may not adhere to your natural, biological prime time. Revisions are important if you want your knowledge to stick, so you’ll want to clear some time in your schedule just for this. It’s best that you schedule your workload so that you finish everything for an exam at least a day earlier – this way you feel more relaxed, and you’ll have a whole day for all additional revisions. Every time you finish a challenging part of the subject or finish all your material for the day earlier, you should reward yourself. Go for a quick coffee with friends, read a chapter of your favorite book, or listen to your favorite podcast. This reward system will provide additional motivation for you to focus on your work at scheduled times, and avoid distractions so that you have time for your favorite activities later. Although it may seem you don’t have time to take breaks or relax, it’s important that you do, so that you don’t risk burnout. Studying according to the Pomodoro technique, one that places great emphasis on breaks, will ensure you do take regular breaks and stay productive and efficient. The gist is that you work for 25 minutes, and then take a 5-minute break – this is one cycle, and after 4 cycles, you take a 20-minute break. Of course, if you find 25 minutes too little time to do meaningful work, and 5 minutes too little time to relax, you can tweak the numbers to fit your needs better – just make sure you do take breaks. Also, it’s important that you keep your sleep routine as close as possible to the sleep routine of your regular days – make sure you sleep for at least 7 hours every day. Skipping meals, especially breakfast, isn’t recommended, as you can’t study hungry, so make some time for a nutritious breakfast, lunch, and dinner. You should also consider naps – taking an occasional daily nap is good for energizing you, but will also help you retain what you’ve learned that day up to that point – forgetting is least likely to happen when you’re sleeping. Of all the activities, exercising may seem like the most redundant one during exam periods, but it can actually help you study better and maintain composure. Exercising increases alertness, so you’ll be more likely to focus and maintain concentration on your subject when studying. You can use your break time for short, energizing exercises of your choice. It also decreases your stress levels (which are usually high during exam periods), as it increases endorphins (known also as natural painkillers). You may be tempted to check whether your answers are correct as soon as you step out of the classroom, but resist the urge. Finding you’ve made mistakes minutes after you’ve handed over your test won’t help you fix them, it’ll only increase your stress levels. Instead, focus on the next exam and try to forget about the previous one. If you’re done with the exams completely, take some well-deserved time off – relax, unwind, socialize with friends, and focus more attention to regular, everyday activities. Only remember that you should at some point return your attention to your studies – so, maintain your everyday schedule, track the time you spend on activities, keep your focus on work when needed, and aim at leading a healthy life.